Lawrence S. Bacow has been named the 29th president of Harvard University. The next president of Harvard University is the son of an Eastern European refugee and an Auschwitz survivor. Lawrence S. Bacow, whose father worked full time while attending a state college in Detroit at night to earn his degree, will take the helm of the country’s most prominent private university on July 1. Bacow, the former president of Tufts University, takes over at Harvard at a time when higher education is under attack for being out of touch and out of reach to many Americans. But on Sunday, Bacow said his family’s journey spotlights the power of a college education to transform generations of lives and the opportunities historically available in the United States. The Harvard University trustees have named Lawrence Bacow, the lawyer, economist and longtime former president of Tufts University, as the school’s next president. Bacow grew up in Pontiac, Mich. His father’s family fled anti-Jewish violence in Minsk before the start of World War II and came to the United States. His mother arrived in Brooklyn at age 19, having survived the Auschwitz concentration camp. She was the only Jew from her town to have lived through the war. Yet Bacow, who is married with two sons, said that while growing up in Michigan, he himself lived a “charmed life,” entering science fairs as a child and operating a ham radio, like his dad. He earned his bachelor’s degree at the Massachusetts Institute of Technology and has law and master’s degrees and his PhD from Harvard. Bacow has spent most of his professional career at MIT, Harvard, and Tufts. First he was a professor of environmental studies at MIT, and then a chancellor at the university. He led Tufts from 2001 to 2011. And since 2011, Bacow, who is a friend of outgoing Harvard president Drew Faust, has served as a member of the Harvard Corporation, the university’s principal governing board. In some ways, Bacow is the ultimate insider. At Tufts, Bacow earned a reputation for shaking up a sleepy university that was being overshadowed by its peers in Boston. He is also credited with shepherding it through both the Sept. 11, 2001, terrorist attack and the 2008 financial crisis. As the Tufts president, Bacow traveled the country, reaching out to alumni, and he urged his faculty and deans to do the same, in an effort to boost donations to finance Tufts’ academic ambitions. He raised more than $20 million for faculty recruitment, attracting up-and-coming professors by offering junior faculty perks, such as long academic leaves that they couldn’t get elsewhere. Under Bacow’s leadership, Tufts spent millions on labs and libraries, and the university increased its research volume by more than 60 percent. He also spoke nationally about the need to make higher education more accessible and affordable to low-income students. After 9/11, just weeks into his presidency at Tufts, Bacow made sure he met with Muslim students to assure them that the university remained a welcoming and safe place, Gittleman said. He had similar meetings with every faculty group in 2008 after the stock market crashed, eating into endowment earnings and worrying Tufts employees who feared the loss of their incomes and benefits, Gittleman said. Bacow was frank about sacrifices that faculty needed to make in the short term and about capital projects that would need to be put on hold, Gittleman said. Bacow who has written a textbook on negotiations, knows how to read an audience and understands how to win over critics, he said. Universities with entrenched faculty and loyalties all competing for limited resources can be difficult places to change, but Bacow managed it at Tufts, Gittleman said. “He built bridges,” Gittleman said. After leaving Tufts, Bacow has remained involved in higher-education policy, working on innovation efforts, and strengthening public research universities. On Sunday, Bacow said Harvard needs to partner and advocate, not just with other elite schools, but with public universities too. Bob Birgeneau, a former MIT colleague of Bacow’s who became chancellor of the University of California Berkeley, said higher education needs a vocal advocate such as Bacow. Bacow isn’t promising to barnstorm on behalf of higher education immediately. 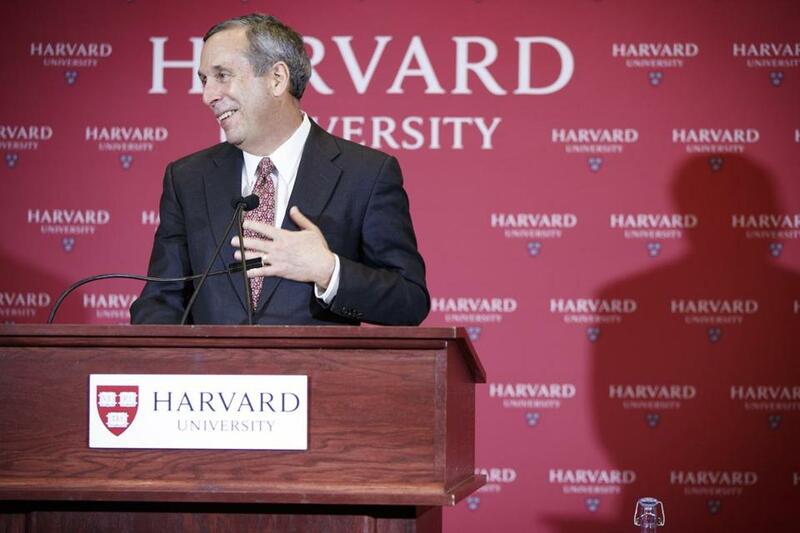 “It’s going to take me a while to find my voice as the president of Harvard,” Bacow said. Deirdre Fernandes can be reached at deirdre.fernandes@globe.com.Follow her on Twitter @fernandesglobe.